I've seen so many house concerts played by new, emerging and successful musicians over the past 12 months. I would've had no idea of the wealth of talent that plays in and around my own backyard (literally and figuratively) without the realisation of Parlour. Going through the archives of our past featured gigs, I realised; a majority of those gigs are female musicians. This is an incredible thing for Australian music and the music scene in general. A number of young Australian women have started making waves in the music industry, and we're super excited to see where they go from here. At Parlour we’ve had the pleasure of following many of these ladies on their musical journeys. We have introduced them to hosts and watched them share stories with guests at intimate Parlour gigs across the country. From the more established to the eager up-and-comers, we’re stoked to be able to support so many ladies at different stages in their musical careers. We’ve picked a bunch of Australian women who have exciting things in the making. Today we’ll introduce you to a selection of our current favourites, including Julia Jacklin, Woodes, Oh Pep, Rowena Wise, The Mae Trio and Jess Ribeiro. Born in the Blue Mountains, Julia Jacklin, now 25 draws influence from Angel Olsen and lyrical genius, Fiona Apple, crafting lyrical stories of her youth and the strange feelings she associates with growing up. Jacklin’s debut album Don’t Let The Kids In features her distinct country-style twang on the catchy single ‘Pool Party’. Woodes combines her talents as an electronic producer with eerie vocals that create a spell over any audience she performs. She is about to release her debut solo EP, and her first haunting single ‘Daggers and Knives’ has just dropped. We can’t stop listening. Olivia Hally and Pepita Emmerichs met at the Victorian College of the Arts in High school and have been playing together ever since. Last year they travelled to the US, delighting Americans with their take on folk-pop with that distinctly Australian voice featuring on all of their songs. The girls recently performed at SXSW and are preparing for a national tour with their new EP Living when they return home to Aus in April. Rowena is somewhat of a Parlour veteran, having played one of the first ever Parlour gigs in March last year and appearing in the first episode of Impromptune. Rowena will release the first single ‘Then We Met’ from her debut album on the 22nd of March, and will be on tour across Australia in April. The Mae Trio are a three-piece lady group who have been making music together since 2011. These three women each boast multiple talents, blending complex harmonies with an array of traditional (and some not so traditional) instruments like banjo, ukulele and cello. 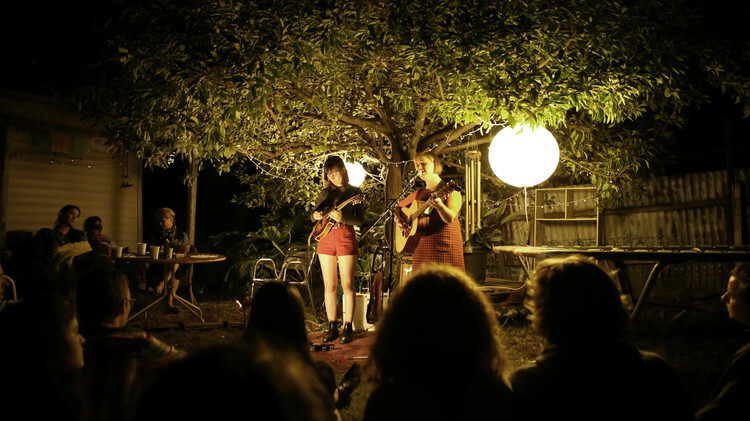 With their combined talents these ladies present an infectious form of acoustic indie-folk. They recently took their instruments and ideas to the US to record in the home of country and folk, Nashville. Very big things are happening for this Trio! Jess Ribeiro is a modest, Melbourne based singer-songwriter with a sound inspired by old school Americana. Nominated for the Australian Music Prize last year alongside Tame Impala, Ribeiro has gained a swell of recent local and international recognition. Jess’ voice is strong and smooth, contrasted beautifully with the dark lyrics present on her most recent album Kill It Yourself. She’s a Melbourne girl with gutsy music ambitions, and we love what she’s producing.